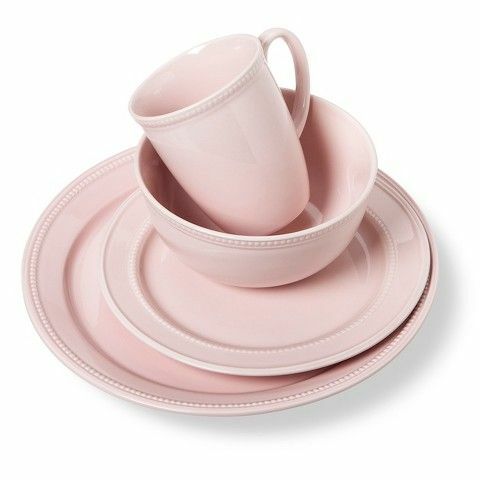 This Pink Camden 16 Piece Dinnerware Set features a sophisticated beaded border. 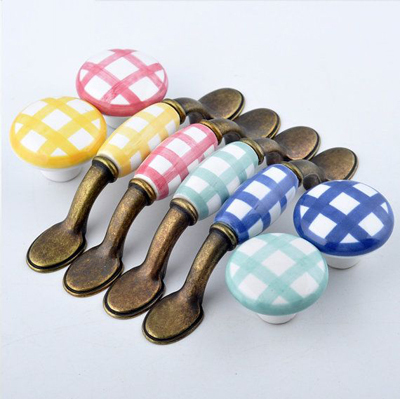 Great on its own or in combination with your existing dinnerware. Made of hard-wearing, glaze-coated stoneware for long-lasting use. Microwave and dishwasher saf. $59.99. Free shipping. Buy here. 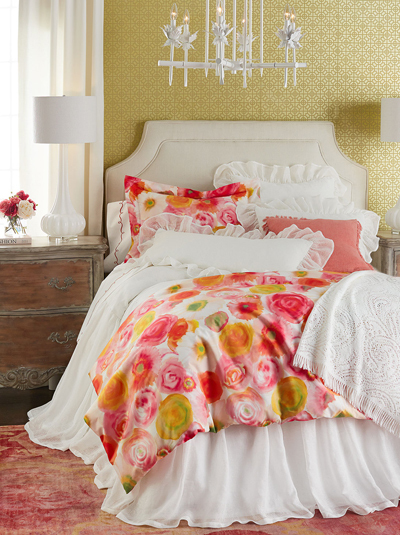 The Elsa Quilt in Pink has both playful pattern & cloud-like comfort for ultimate cozy bed appeal. It’s a win-win for this one! So soft & lightweight, it’s warm in the winter & cool in the summer – overall the perfect piece to snuggle up in! $225. Buy here. 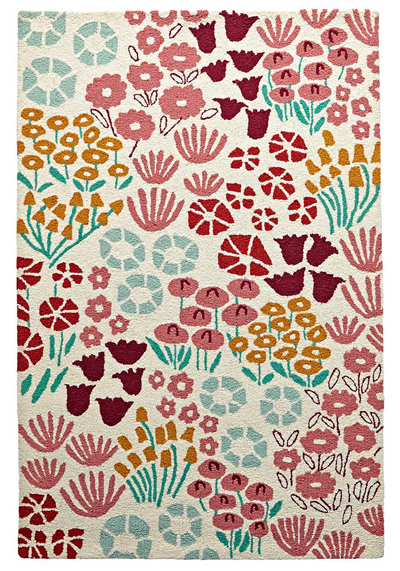 This eye-catching Local Floral Rug designed by Elizabeth Olwen is made of premium quality New Zealand and European wool and features all loop construction. $249-$699. Buy here. 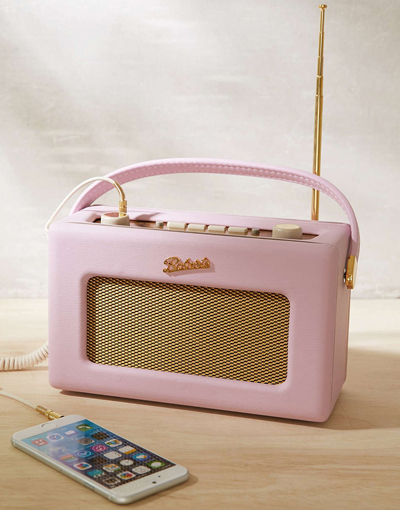 Revive your music’s sound with this vintage must-have portable Pink Roberts Radio Revival Radio. Works off batteries or AC adapter to deliver high-quality sound anywhere. $220. Free shipping. Buy here. 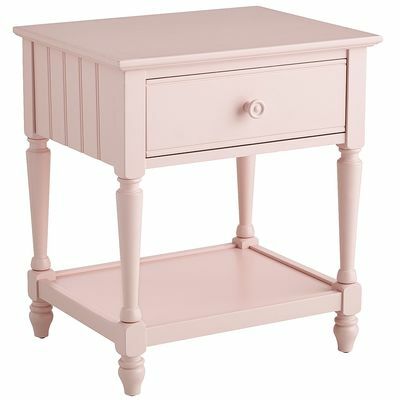 With its pink finish, this Pink Cottage Nightstand features elements of a cozy rustic style, including simple, honest lines, beadboard-inspired accents, crown molding, scalloped aprons, knob pulls and Sheraton legs. $229.95 Sale $195.45. Buy here. 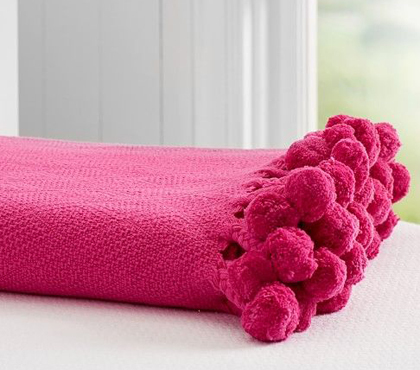 Ultrasoft and brightly colored, this cozy Bright Pink Pom Pom Throw features a playful pom-pom trim. 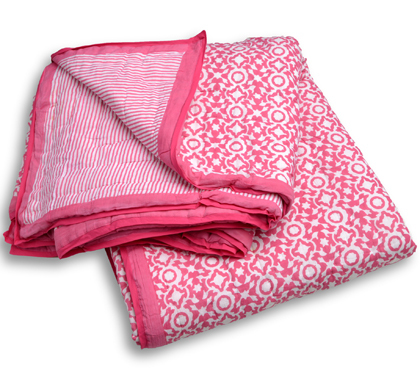 The brushed fabric is hypoallergenic and non-pilling, and retains its plush softness wash after wash. $69.50. Buy here. 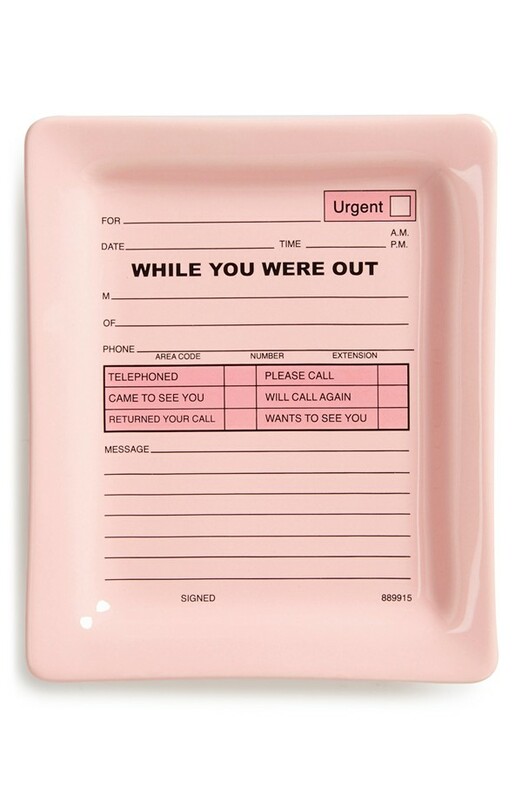 A pink-slip ceramic While You Were Out Tray acts as a little reminder to serve up some fun while you’re away from work. $12.95. Free shipping. Buy here. 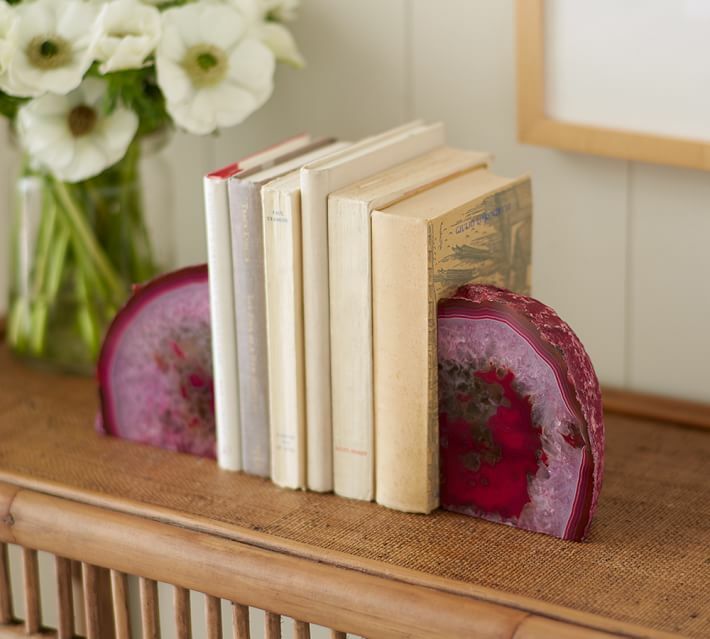 Weighty and elegant, this Pink Geode Bookends Set props up books on your desk or shelf. Natural agate gemstones were polished to the highest sheen to showcase their one-of-a-kind designs. $79 Sale $54.99. Free shipping. Buy here. 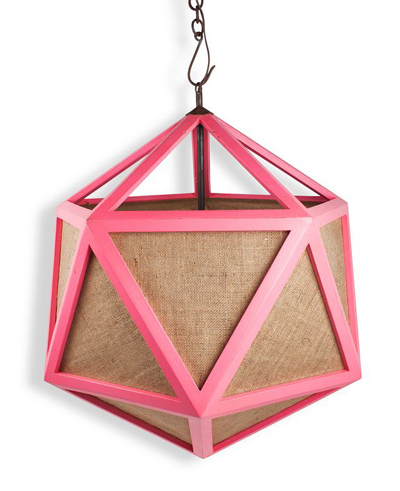 A striking statement, this large decahedron Pink Deca Pendant Light mixes a pop of bright pink with organic jute. $495. Buy here. 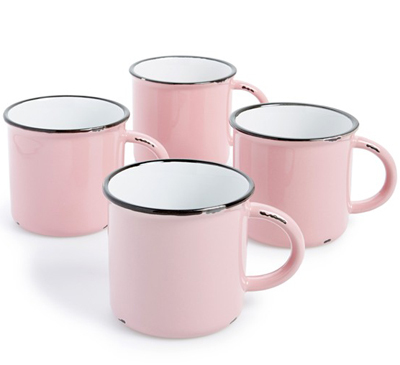 These Pink Tinware Mugs are made of glazed stoneware that mimics the style of vintage metal cookware. With realistic distressed edges and a contrasting rim stripe, this enamelware will give your morning coffee break a nostalgic touch. Dishwasher and microwave safe. Set of 4. $48. Free shipping. Buy here. 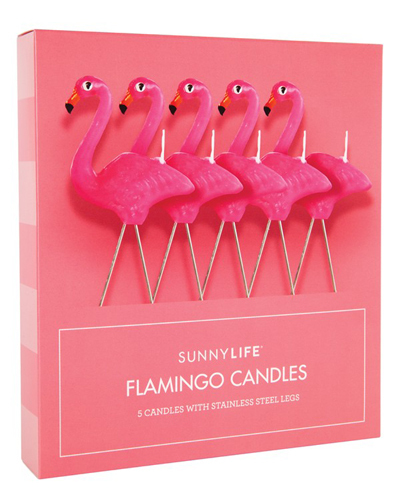 No longer just for lawn ornamentation, the pink flamingo becomes the center(piece) of the party with this playful Flamingo Candle Set that prances across any cake for a tastefully flamboyant finish. $17. Free shipping. Buy here. 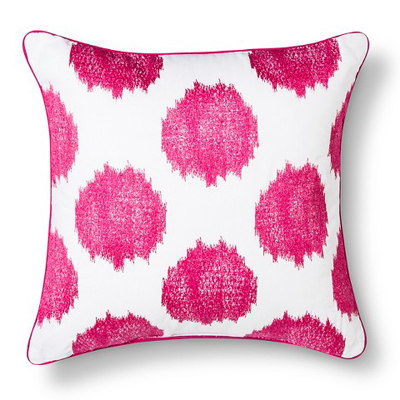 Make a statement with this Ikat Dots Decorative Pillow featuring piping detail and an embroidered printed design. $24.99. Buy here. 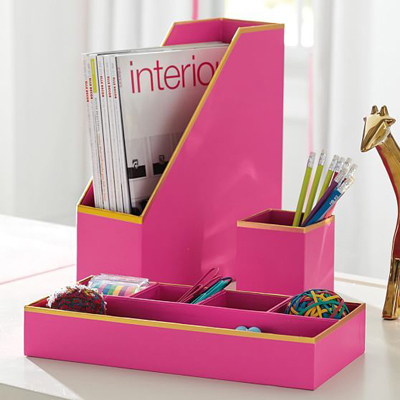 Deck out your workspace with this Pink Printed Paper Desk Accessories Set featuring a trio of smart and stylish storage pieces designed with gilded edges. $39. Free shipping. Buy here. 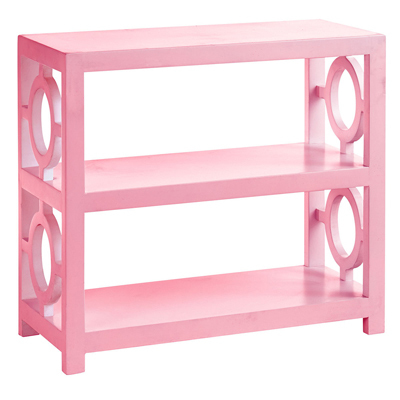 This eye-catching, mid-century Pink Contemporary Accent Table with ample shelving space is great as a low console or a side table. $549. Buy here. 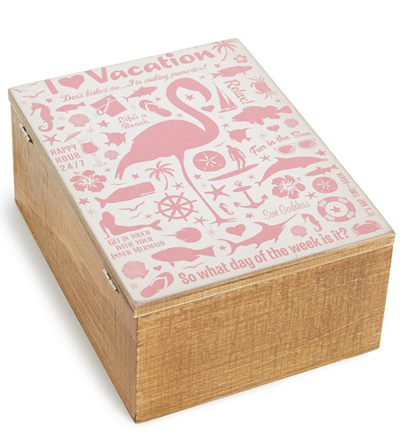 Store your favorite vacation mementos in this wooden Vacation Hinged Box that’ll lend a bright touch to your home décor. $20. Free shipping. Buy here. 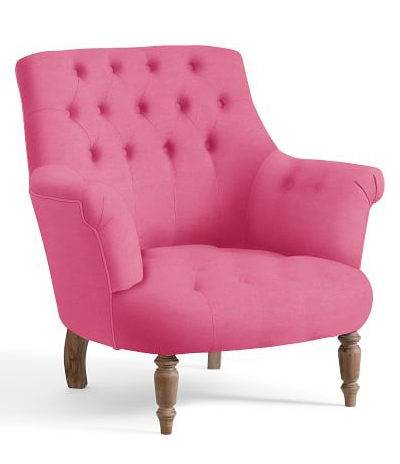 The Bright Pink Salinger Upholstered Armchair projects the distinct air of a vintage find that has been flawlessly refurbished. A pouf-style seat and button tufting give it a unique personality. $949. Buy here. 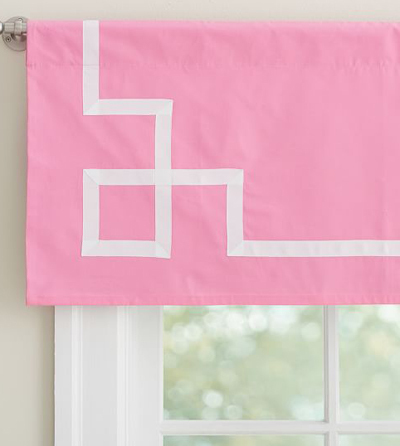 Elegantly simple, this Pink Ribbon Trim Valance is decorated with grosgrain ribbon for a tailored touch. Use it on its own, or pair with panels to give your windows the perfect finish. $29.50 Sale $25. Buy here. 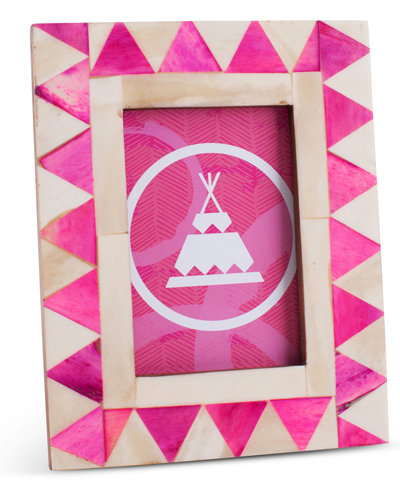 This Pink Pyramid Tribal Bone Frame is a pattern-packed wood-backed frame to accent your favorite photo. $35. Buy here.